For those of you who are new to The Life of JWo, I write our “Travel Logs” each day when we go on vacation. 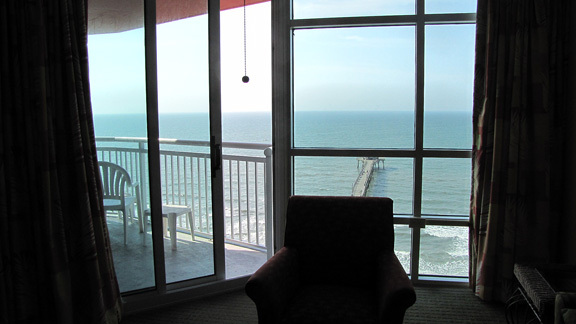 This is Day 7 of our 2012 trip to Myrtle Beach. You can read my 2009, 2010 and 2011 logs by clicking on the year. Today (Friday) is a sad day because we have to be out of the resort by 11 a.m.
We had packed most of our stuff last night so we didn’t have a ton of stuff to do in the morning, but we still had plenty of things to keep us busy. Tammy wanted to capture the view from our living room. I took the big suitcases down to the car early in the morning and went back up to pack everything else on one of those carts so it would only take us one trip to be done. I wasn’t surprised to see Tammy moping around, mumbling about not being ready to leave and snapping pictures of the room. Then she turned on me… Fortunately I was able to cover up my private parts. We had to be checked out of the resort by 11 a.m. and I was shocked to see that we had the car loaded and were pulling out of the parking garage around 10:15. Tammy wasn’t surprised. She was pissed. Tammy: What the hell? It’s just 10:15? We coulda had at least another hour here. We had decided to run back out to a few of the shops to kill some time before heading up to see Ashlee and Billy again on and were debating on what to eat. 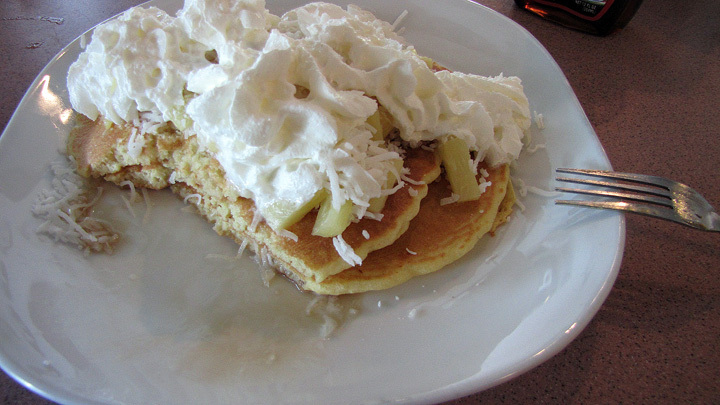 Tammy: Plus, I think that’s the one that I saw an ad saying they have 16 different types of pancakes. I was sold and we began looking for the unique sign as we headed into Myrtle Beach. We were inside and checking out the menu when Tammy got a little upset. Tammy: See, they trick ya. They say 16 different types of pancakes but I didn’t think that would include the “regular” ones. 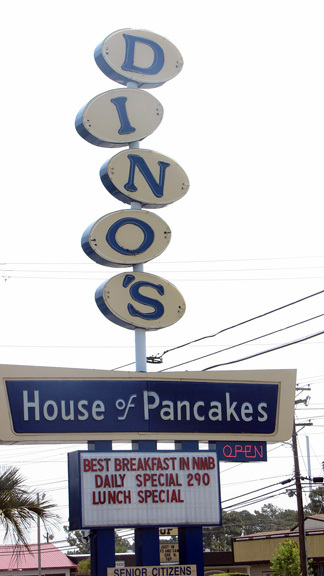 We decided to stay and I ordered Dino’s Tropical Pancakes with my eggs and hash-browns. Not the “fresh” pineapples as mentioned in the menu, but still pretty d@mn good. Seriously, That’s What You Went With? We headed back out to the Broadway at the Beach because there were a “few shops” Tammy didn’t get to go in the last time. We found a parking spot and as we were walking in we couldn’t help but notice a “tricked out” BMW. Tron? Seriously? Tron wasn’t even cool when it first came out. I hope they won this car and didn’t do this themselves. We started the trek around the shops trying to find the stores Tammy had yet to go into. We were about halfway through before she found the first store she wanted to go in. It was a “chick store” so I found a spot on a bench inside the store and waited for her to be finished. She didn’t get anything but at least she could mark it off her list. 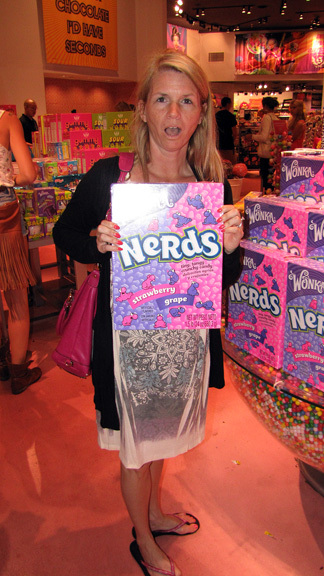 We headed back to the big candy store called Sugar, where Tammy fell in love with a giant box of Nerd’s. I suggested she try to find The Boy (aka Jake) some Tootie Rolls (aka Tootsie Rolls), figuring they’d have a giant container of those as well. We circled the store searching for Tootie Rolls and were disappointed in their selection so Tammy started looking for other stuff to bring home for The Boy and Grace. She picked up a couple of boxes of candy cigarettes and I threw in some Oh Henry! bars because Jake and I liked those and thought we were done. Tammy: What? No. I was looking at stuff for them and not for me. We had to circle the store again. She eventually got a bag of gummy stuff and we were able to checkout. 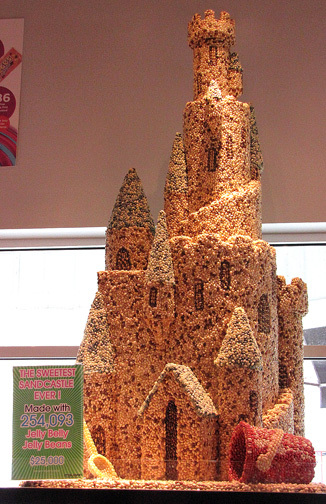 Once we were done at the Sugar, we finished with the rest of the shops and started to leave Myrtle Beach behind us. But on our way out of town Tammy spotted something so I turned around. On our way down she had mentioned how funny it would be if we stopped and took a picture of her in front of every stadium we passed. 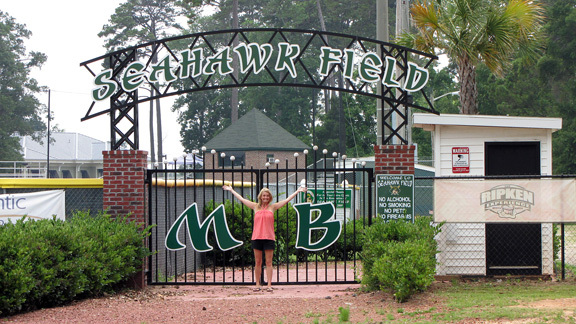 We passed plenty of stadiums/ball fields along the way, but most of them weren’t where we could stop. But, it just so happened we passed a high school baseball field on the way out of town so I stopped and Tammy excitedly jumped out of the car. The one and only stadium we stopped at. I briefly thought about pulling away as she was standing in front of the gate, but I let her get back in the car and we headed toward Spring Lake. We checked into the Hampton Inn and went over to Ashlee and Billy’s house to figure out where we should go for dinner. We discussed a few places before settling on Ruby Tuesday. I should have known we were in trouble because we’d had great service at every place we had eaten all week. Had I thought about our “wonderful” experience last year in Gulf Shores (here) I would have been better prepared. Instead I was too wrapped up talking with everyone. The waitress, Katlyn, introduced herself and offered some drink suggestions for Tammy and Ashlee. We placed our drink and appetizer order and got back to talking. Katlyn brought out our drinks, took our food order and a few minutes later she stopped by the table again. Katlyn: You guys ordered the queso as an appetizer, right? Katlyn: That’s what I thought, but I just wanted to make sure. It’ll be right out. That’s when I really should have known it was going to be a bad night, but that glass of Coors Light had gone down pretty quickly and she was the last of my worries. She buzzed by the table a couple more times, even brought me another beer, but not our appetizer. So the next time she came by I reminded her and it was like a light bulb went off in her head. The next thing we saw was our food coming to the table. The runner started handing out the food and realized that two of Tammy’s sandwiches had been ordered and took one back. Everyone else at the table got their food except me. As the runner was putting down the food Katyln brought out our queso dip, put in on the table and left. What Do They Say About Assuming? I assumed that the runner was going to tell Katlyn about the mix-up and that my burger would quickly be coming. I sat and watched everyone eat and saw her pass our table three times before I said something about it. I could tell by her reaction she didn’t know about the problem. She apologized profusely, said this has never happened to her before and she’d bring the food right out. She did bring the food right out, just not what I ordered. The only part that was correct was that it was a burger with cheese on it. But this one had bacon, mine didn’t. This one was cooked medium-well, mine should have been medium-rare. This one had a side of grilled green beans, mine should have had sweet potato fries. At this point I was starving and everyone else was halfway through with their meals so I just ate the burger, but I told her about the fries because they were $1 extra. More apologizes and she came back with the fries. We were thinking she would tell the manager and that he would come over to the table and offer to take some of the items off the bill. The bill came and everything was on it, the late-arriving queso dip, my incorrect burger, the sweet potato fries, and it was over $100. The next time Katlyn came over to the table Tammy gave her a piece of her mind. Tammy: Look, we’re gonna pay the entire bill, but you REALLY should have taken some of the stuff off or told the manager so he could do it. Katyln had a deer-in-headlights look as she left the table and went back to flirt with the host, which ticked Tammy off even more. Tammy: She doesn’t care. She’s over there flirting with that guy. Tammy: I can tell by her body language that she’s flirting. I thought for sure the manager would come by at that point, but he never did so we paid our bill and left. When we got back to Ashlee’s I emailed a complaint to Ruby Tuesday and got calls from the manager (next day) as well as the district manager (two days later). We went back to Ashlee and Billy’s house where I was able to start my journey down Whiskey Road (see my discussion about needing to start drinking whiskey so I can write better – Day 2). I tried some of the Jack Daniels Honey with a little Dr Pepper 10 and liked what I tasted. Maybe this journey won’t be too bad after all. We made it back to the room and Tammy crawled into the giant king-sized bed. I was pulling out my laptop to start writing my thoughts when I heard Tammy. Tammy: I’m in heaven because this bed feels so good. I just ate a bunch of good sugary sh!t and I have a wall (of pillows). I decided to crash her party but because of her wall she didn’t even notice as she faded off to sleep. You totally should have given the manager a piece of your mind at Ruby Tuesday’s. At least you got the $20 gift card out of it later.